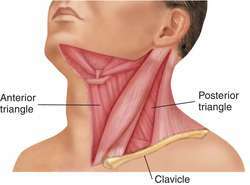 a triangular area bounded by the median line of the neck in front, the lower border of the mandible, and a line extending back to the sternocleidomastoid muscle. The mass was located in the anterior triangle of the neck on the right side, in the area of the sternocleidomastoid muscle. 5 cm in the right anterior triangle of the neck suggesting tuberculous lymphadenitis. An 11-year-old girl presented at our department with a swelling in the anterior triangle of the neck. Deep cervical plexus block is a well established regional anaesthetic for operations in the anterior triangle of the neck including awake carotid endarterectomy surgery, lymph node biopsy and plastics. Type II cysts are associated with the submandibular gland or found in the anterior triangle of the neck. The hypoglossal nerve enters the paravertebral spatium and descends to the anterior triangle of the neck.